Take to the skies on the world-famous London Eye for sensational views of London’s skyline. Step into one of the iconic glass capsules as you’re taken 135 metres above ground level! Soak in spectacular sights of the city’s most loved landmarks including the Queen’s official royal residence Buckingham Palace, the historic Houses of Parliament, the royal wedding venue of Westminster Abbey, the city’s glass skyscraper the Shard, the formidable Tower of London and many more. See the heart of London, the River Thames, sparkle beneath you as you enjoy panoramic views of the capital from one of its most gorgeous viewpoints. For 30 whole minutes, you’ll get to put your selfie-skills to work and get snap happy in the skies before descending for your London Eye 4D experience! 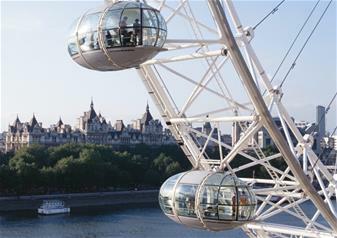 Your same day standard ticket includes the London Eye’s extra special 4D experience. This immersive experience uses special effects of bubbles and mist to bring this heart-warming tale of a father and his daughter on a day out to London to life – an unforgettable end to your London Eye adventure!